One of my favourite zombie flicks is here! I remember watching this movie and being absolutely enthralled with it. The bad acting, the gross effects and the alternative viewpoint on zombies from an Italian director rather than the US stalwart George A. Romero movies of the time. 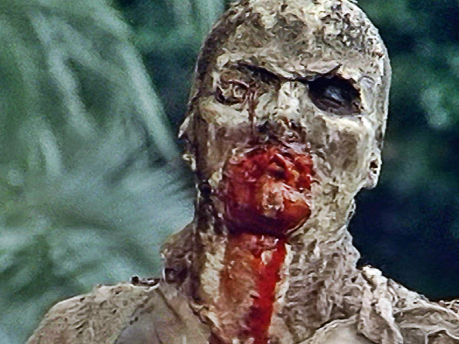 In fact Zombie Flesheaters was called Zombi 2 in some regions in order to cash in on a supposed link to Night of the Living Dead. This was probably a pointless exercise as people were more than keen for any take on the zombie genre back in the day. Another interesting fact is that due to its appearance on the "Video Nasties" list in the UK and its subsequent banning in many countries its popularity grew exponentially. Indeed it is probably due to this that it now has cult classic status.